The Poulan Pro 24" Dual-Stage Snow Thrower packs the punch required to devour snow. 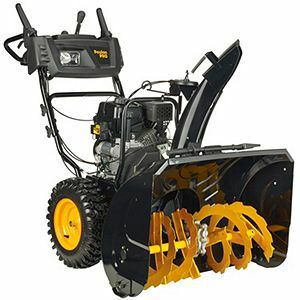 Featuring a 208cc Briggs & Stratton-branded cold-weather engine, this unit can tackle heavy-duty snow 24" wide and 23" high. The 13" snow tires and 12" auger provide great traction and increased performance by drawing snow into the impeller and propelling it up to 40' away. Added creature comforts include heated grips for those really cold days and power steering to make the job even easier. Unit comes standard with an electric start as well as a manual pull start with an oversized handle, making it easy to use with large gloves or mittens. The mostly steel construction is extremely durable in cold weather and resists stress cracks and damage more so than comparable units with plastic chutes and components.